The Internet created a paradigm in the wireline telecommunications industry that resulted in the development of new services and applications based on Internet protocol (IP) technology. 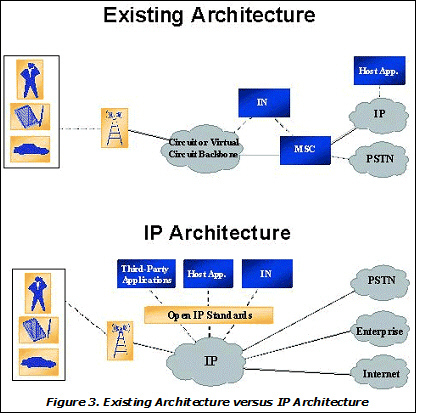 The influence of the Internet and IP technology has extended to encompass the cellular industry where standards bodies, operators, and radio access network (RAN) equipment vendors have embraced IP as the networking architecture of choice for delivering a whole new class-of-service application offerings. radio and 15 years for 50 million people to use TV and cellular communications. Internet users reached the 50-million mark in just 5 years. During that time, the world became increasingly mobile, defined by the take-it-with-you philosophy we have developed regarding information and our access to it. For the wireless cellular industry, that shift in attitude has created the opportunity to add mobility to Internet accessibilityâ€”effectively allowing subscribers to carry the power of the Internet with them anywhere at any time (see Figure 1). 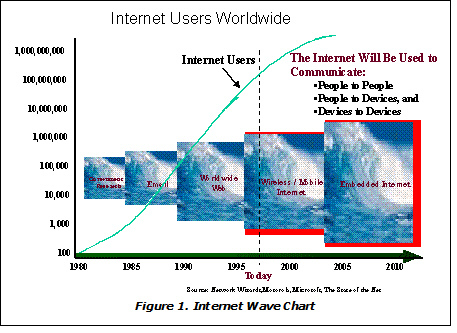 The convergence of wireless and Internet usage is already underway. Globally, Internet users as a whole are projected to increase from about 200 million at present to almost 1 billion by the year 2005. 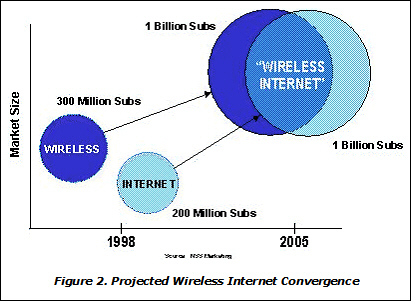 During the same period of time, global wireless subscribers are expected to increase from 300 million to over a billion. With these market dynamics in mind, several industry-leading businesses have agreed that next-generation wireless networks will leverage the packet-based technology of IP. 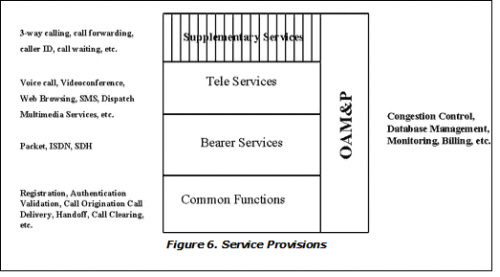 This strategy provides operators with the unique opportunity to deliver a multitude of new services to mobile cellular subscribers in a manner more customizable than previously possible (see Figure 2). As the industry continues to invest heavily in advancing IP technology for supporting real-time applications such as voice with reliable service and toll quality, it is expected to further accelerate the introduction of new network capabilities that are defined within IP standards for network implementations. Next-generation architecture will be flexible, open, and standards-based. It will facilitate a smooth migration from existing hierarchical circuit-switched technology to peer-to-peer, packet-switched networks. These wireless networks of the not-so-distant future will be able to take advantage of the true peer-to-peer communications technology of IP to deliver better value to service operators and end users alike (see Figure 3). 1. superior end-user experienceâ€”The network must be customizable, easy to use, and allow fast access to all services from a single device. 2. orderly network migrationâ€”There must be a smooth migration path from existing network protocols to the new wireless IP network, and the new network must demonstrate superior performance. 3. reduced cycle time to commercialize applicationsâ€”The network must make Internet applications easy to implement in the wireless world. Thus, existing services are made immediately available, while new applications may be made available in the wireless world at the same time or faster than they are made available to wireline users. 4. reduced cost of ownershipâ€”The new network must make the business case for the wireless Internet achievable, particularly for worldwide operators and service providers. The following sections will describe a new-world, wireless IPâ€“based network model being developed jointly by two of the worldâ€™s leading communications enterprises: one in the wireless communications industry and the other in the IPâ€“based Internet communications business. Together, these two enterprises are creating a mobile wireless IP network that meets tomorrowâ€™s requirements by providing opportunities previously only imagined. Among such opportunities is the ability to make wireless an integral part of the Internetâ€”rather than just another access technology. The architecture assures that these functional elements are seamlessly interconnected and facilitates connecting additional networks to the core network. These additional networks include the Internet and other packet-switched IP networks; traditional telephone service networks, including public switched telephone network (PSTN) and integrated services digital network (ISDN); and legacy signaling system 7 (SS7), interim standardâ€“41 (ISâ€“41) mobile application part (MAP) and Global System for Mobile Communications (GSM) MAP information transport networks (see Figure 4). This contains the radio access functional network elements that work together for providing the mobile subscriber network access over an air interface. 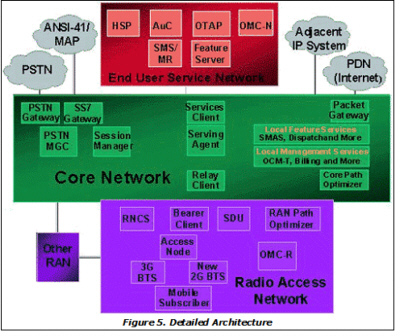 The radio access network (RAN) provides the basic transmission, radio control, and management functions needed for the mobile subscriber to access the resources of the core network and the end-user services network. 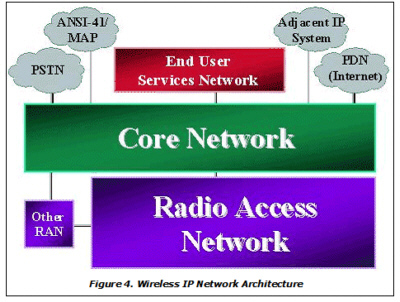 It is this access network that terminates the air interface to the mobile station (MS) and converts the air frames to packet format for transporting traffic between mobile subscribers or extending the reach of the mobile subscriber to other RANs and external networks. The network topology for provisioning the RAN is a key element in terms of defining the flexibility for backhaul options from the base transceiver station (BTS) to include bandwidth options that are higher than the current T1 and E1 deployments. Also, given that T1 and E1 backhaul rates will require continued support in the foreseeable future, the choice of protocol for backhaul transport becomes an important criteria for assuring maximum efficiency on the lower-speed T1 and E1 links (see Figure 5). This contains the functional network elements that work together for linking subscribers with feature servers and internetworking gateways to external networks such as the Internet, PSTN, corporate enterprise intranet, and other RANs. The core network also provides the interface into network management and connects RANs with mobility management, security, and signaling functions. For third-generation network deployments, the core network will be recognized as the key investment operators make for securing a superior competitive position by offering an extensive variety of services. The core network is designed to be access technologyâ€“independent. The core network leverages IP for control and transport. The peer-to-peer network is enhanced by using client/server technology within the network, presenting the mobile subscriber with a network environment that is already familiar because of its Internet feel. The core network is designed to leverage the enhancements available by moving to packet with the definition of open interfaces to provide the operator the ability to enhance the system offering, commission features from third parties, and reduce overall operating costs. The network is a unique combination of functions that leverages the individuality imposed by a mobile network with the proven concepts of IP. The core network is designed with the understanding that an active subscriber may have multiple active sessions but may not be physically connected, thus enabling an always-connected, always-on subscriber experience. The importance of a services client acting on behalf of the subscriber and its awareness of all of the different sessions is one of the unique features found in this network architecture. The aim of the architecture is to repeat the success of open interfaces found in wireline networking. These objectives will be achieved via a core and RAN network architecture that leverages existing standards but permits the possibility of extending newly defined open interfaces for new, mobile-oriented, end-to-end services that will range from multimedia, mobile video, Web browsing, and electronic commerce. This plane hosts a variety of services that is available to mobile subscribers based on their access profiles. These services may be provided by operators and third-party content and service providers and include Internet and private value-added network content such as news and information, video, and other media that can be delivered to consumers through their wireless subscriber devices. The end-user services network contains specific functions and, when interoperating with core network functions, the mobile subscriber will experience the feel of a wireline network with the added value of being completely unrestricted by the bounds imposed by the wireline network. The services delivered to the subscriber will include the expected voice mobility enhanced by the expanded ability to execute any IPâ€“based application transparently in the eyes of the subscriber. This experience will be enhanced even further with the anticipated deployment of new IPâ€“based services specifically designed to leverage the concept of mobility. These three architecture planes work harmoniously as layered networks for delivering complete end-to-end service to mobile subscribers. The fundamental premise driving the new communications architecture is the convergence of the voice and data realms. However, there are basic differences in the traditional regulation and provisioning of these services. In this model, the core network plays a central role in connecting a myriad of host services to subscriber access networks. The architecture permits services to drive the functionality and added value of the wireless network. A key set of common functions and basic services must be supported to have a viable service offering. This key set of functions and services includes the ability for subscriber terminals to register, originate, receive, maintain (i.e., hand off or hand over), and clear voice and data sessions via one or more different media types. It also includes an initial set of supplementary services that add features to these basic call capabilities. The set of services offered will be expanded as value-added services, developed by third parties, and added to the network through open interfaces. packet servicesâ€”This is the data transport, providing carriage for services such as voice and data, that facilitates the delivery of wireless services. IP services include transparent support of existing IP applications and new value-added IP services that specifically leverage the advantages of a mobile environment. common functionsâ€”This is the base layer of functions, such as call registration and origination, that supports all subsequent layers of services and upon which all other layers of functions are based. teleservicesâ€”These are the basic services delivered to the end user, such as voice calls and data sessions. supplementary servicesâ€”These are the enhanced teleservices, such as caller ID and teleconferencing, plus new supplementary services enabled by an IPâ€“based services model. operations, administration, maintenance, and provisioning (OAM&P)â€”These are the supervisory functions, such as network monitoring and billing tracking, that keep the network operating efficiently and effectively. value-added servicesâ€”These are the services residing outside the alliance architectureâ€™s core network offering that are supplied by the network operator, content provider, and enterprise and endpoint applications and services (see Figure 6). A new communications architecture that will enable true peer-to-peer wireless communication and client/server operation is being developed jointly by leaders in the mobile communications and Internet networking industries. The resulting new architecture will deliver a world-class, IPâ€“based networking solution to wireless network operators worldwide. The architecture supports current wireless standards and assists operators in their migration efforts to the emerging 3G wireless systems. 1. superior end-user experienceâ€”The architecture specifically targets the open philosophy and application-enabling capacity of IP for creating an RAN and core network infrastructure designed with the subscriber in mind and tuned for supporting the many new feature characteristics delivered by innovations in mobile station technology. The mobile subscriber will enjoy a freedom unequaled by other network access and service-delivery systems. 2. orderly operator network migrationâ€”The architecture provides operators with an orderly migration path to IPâ€“based networking for achieving peer-to-peer, nonhierarchical communication and a client-server operation while maintaining interoperability with the existing RAN infrastructure. 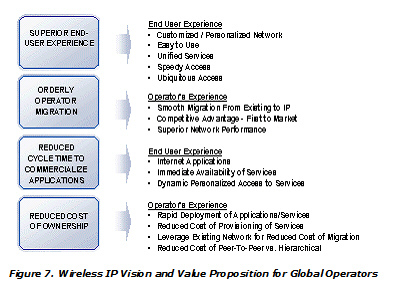 An operator can introduce new, IPâ€“based services while maintaining support for existing services and capabilities. Furthermore, each operator can choose how and at what speed it should deploy 3G wireless systems. A distributed network model will demonstrate significant gains in system performance, quality of service (QoS) capacity, and scalability. Operations costs will be reduced, and more intelligent operations, maintenance, and provisioning will be enabled across the network. 3. reduced cycle time to commercialize applicationsâ€”The architecture permits the separation of subscriber services and the wireless network, thereby enabling network operators flexibility in deploying end-user services and applications independent of wireless switch manufacturers. Through open, external application programming interfaces (APIs), operators and third-party developers are able to deliver new features and applications in a rapid fashion. The end result is an expanded solution set, with faster and more economical deployment for generating new revenue streams for the operator. Copyright ® 1992-2019 Softdisk India. All rights reserved.